They say it's taboo to put ketchup on a genuine Chicago dog. 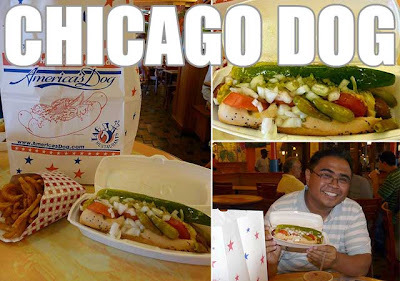 A Chicago dog is a steamed or boiled all-beef hot dog on a poppy seed bun. Toppings include mustard, sweet pickle relish, onion, a dill pickle spear, tomato slices, sport peppers, and celery salt, but never ketchup! So since I was in Chicago, I made sure to try one.